Here we have a delicious combination. Cranberry Moon Farms’ BFL plied with RanMar Alpaca. Totally easy. Totally dramatic. Soft and gorgeous. Oh those Stack Traps! Two animals, two blankets from RanMar Alpacas, one brown one tan, plied together trapping natural brown and natural green cotton from Dove’s Roost Farm. Oh. Gorgeous. 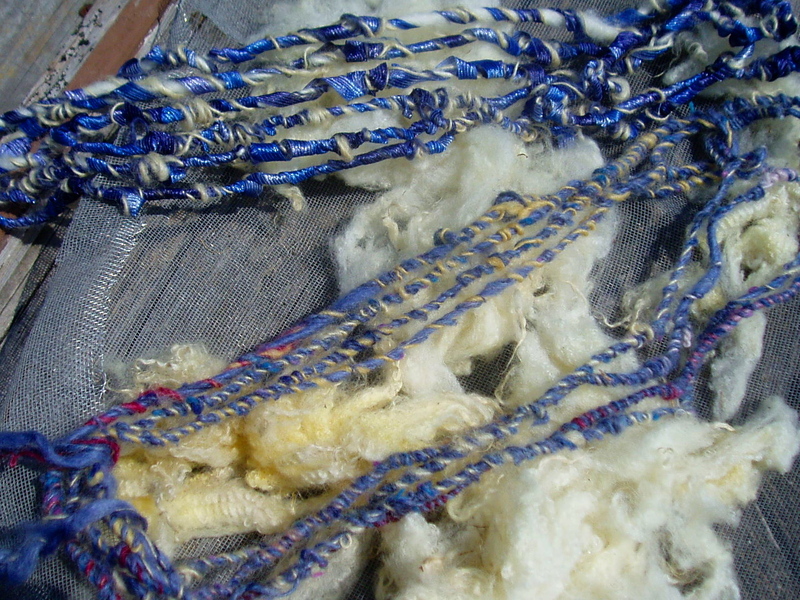 On the right…Gulf Coast Sammy, spun in the grease, with RanMar Alpacas Lance stacking up! Oh COILS! Rockin! Oh Supercoils – Red is so not photogenic! So, this was the Bumps chapter. And I have to say, these cool and fancy yarns are coming off the wheel as balanced as can be. Anchors are pretty much effortless. And I’ve come up with some interesting ideas of my very own. But, for now, I’m sticking to the game plan, and going yarn-by-yarn, through spin art. Okay okay. A few little skeins…about 25 yards each. 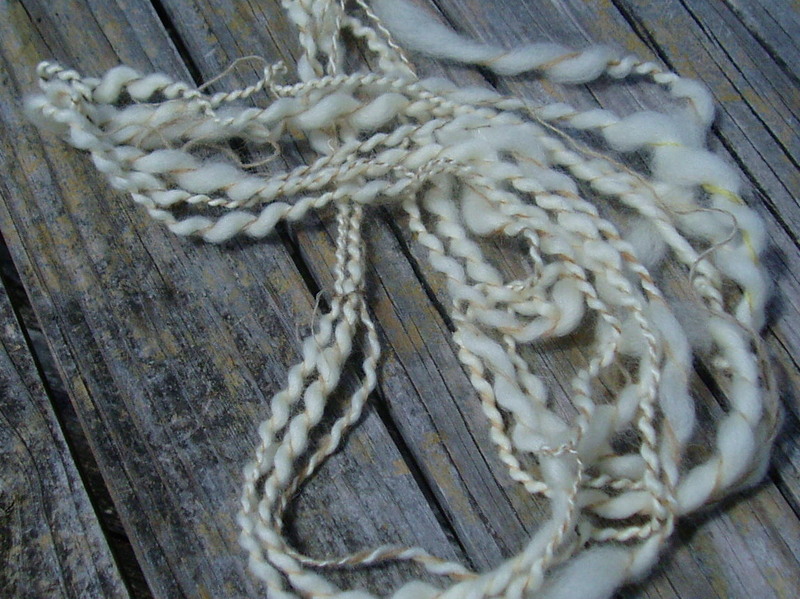 On the top, a thick & thin yarn spun from lambswool. The “thicks” being quite fuzzy, as Mary is a very fuzzy girl. 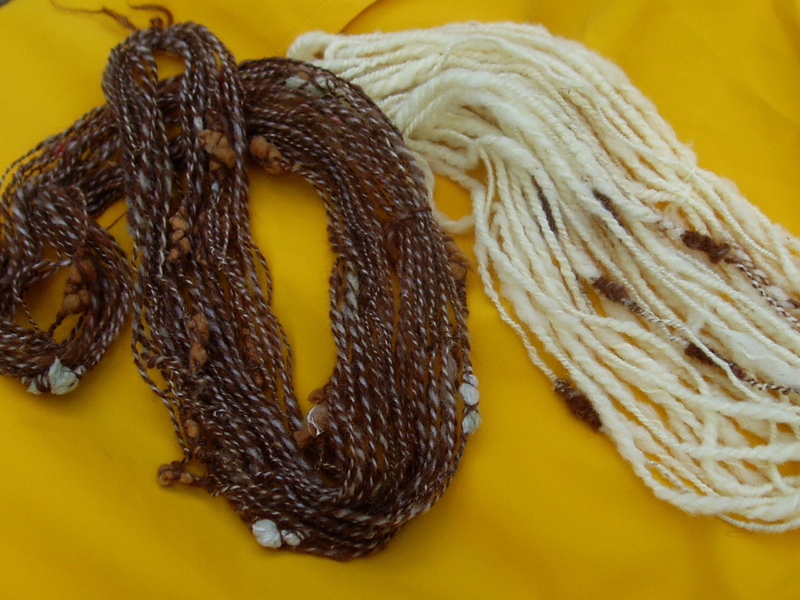 The solid yellow yarn is soft as silk, because it is, however this is not a useable yarn. There is not enough structural integrity in the “thicks” because they are dreadfully underspun. Soft and pettable, but hardly knittable. The tri-color yarn is natural Gulf Coast, Corriedale dyed with coreopsis (pale orange), and indigo dyed Gulf Coast “Holly.” The beehive yarn ultimately takes just a bit more time and fuss than the cocoon yarn in the last post. I’d love to see the beehive yarn knit up. Yes I would. Last night, I stayed up late. There was to be a webcast from CERN at 3AM, announcing success in the search for the Higgs boson. I’m working my way through jacey boggs’ swell book on textured spinning, spin art, and I welcomed the alone time in the wee hours – I could spin uninterrupted. So, I picked up where I’d left off: Corespinning – Cocoons. 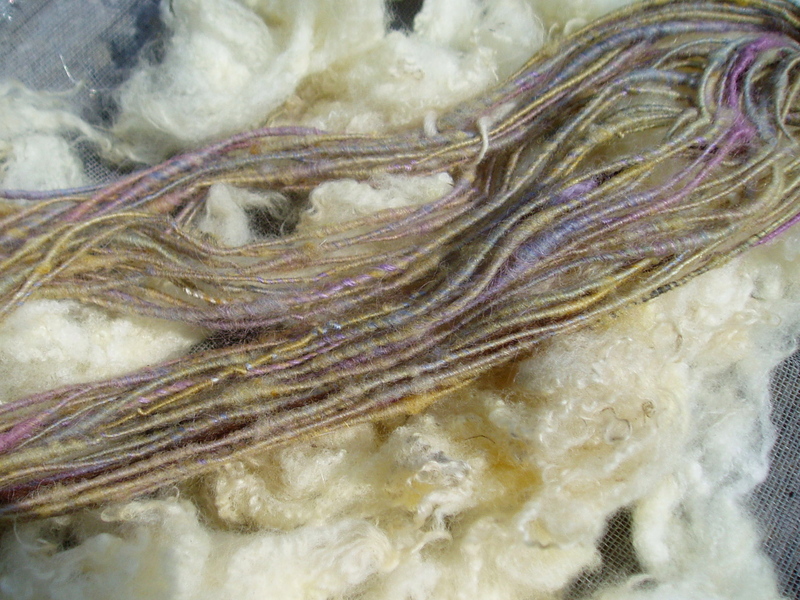 I collected a few bits of colored fiber (I’m not big on dyed fiber) and some of my lambs’ 2012 fiber (which I’d carded into batts) and watched the Corespinning section on the dvd again. Then, I read the bit on Cocoons. Clear enough. 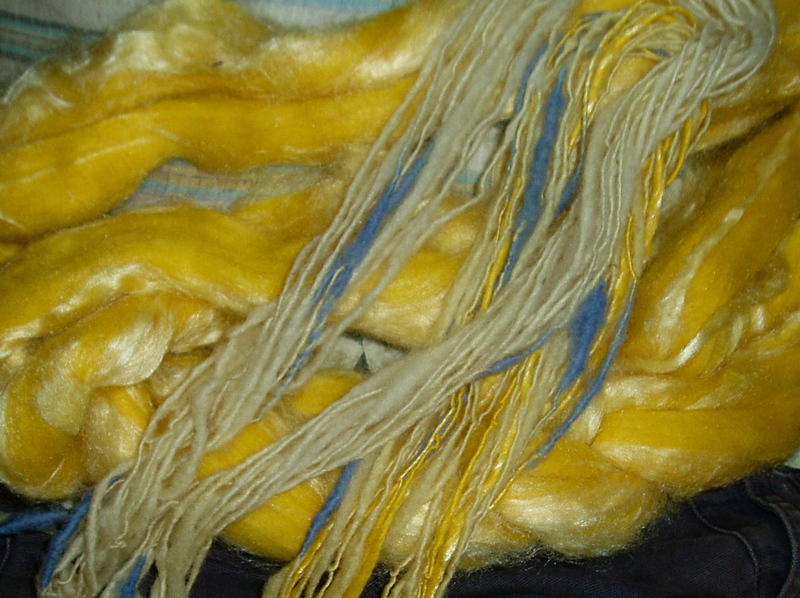 First off, I pulled out a naked undyed batt of Curly Lumpkin, some yellow silk fiber, and some indigo dyed fiber from Curly’s Aunt Holly. First attempt was not embarrassing, and actually, quite a lot of fun. Once again, I had a little trouble controlling the tendency for the yarn to be overspun. 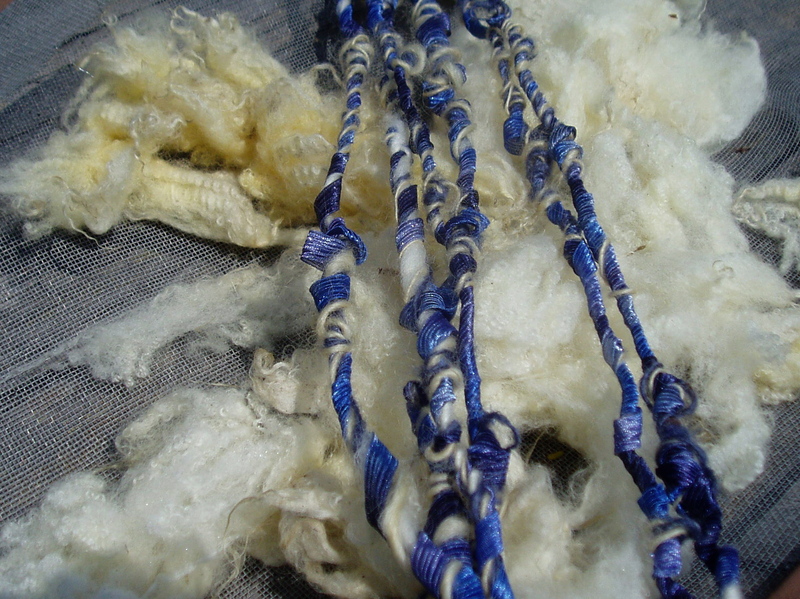 My second attempt was spun from a batt of Mary’s fleece and her Mama Holly’s blue fiber for cocoons. This yarn came together well, was not overspun, but, I realized I was spinning a perfect thick-and-thin. These little samples were a lot of fun to spin, and I know that I will be revisiting this technique soon. I can see these yarns knitted up, in my mind’s eye, and I like what I see. Today, the 4th of July, is traditionally, a day for bbq and relaxation. So, I made a gigunda potato salad and a dry rub for a boneless pork roast, and picked some peppers and tomatoes and cukes and made a heck of a salad. We enjoyed a silent neighborhood. Not a firecracker. Not one. Not a car up or down the road. Not a kid yowling, hollering, or crying. We enjoyed the scene. We enjoyed strolling through the pasture. We enjoyed the day. I did not spin until the critters were all tucked in. 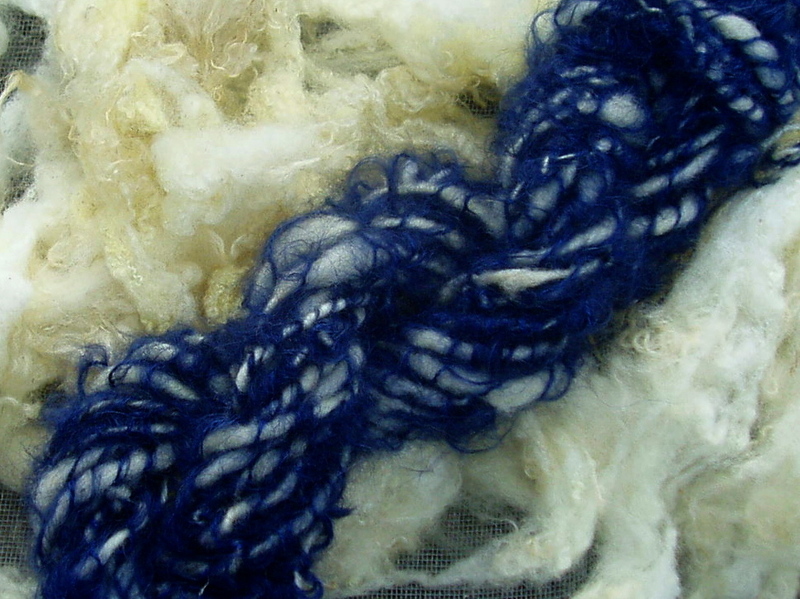 Now, it doesn’t take a genius to know that it takes clean curly locks to make a tailspun yarn. I had a handful. Literally, a handful. The locks I had came from a Border Leicester sheep, one of the funniest looking sheep, in my opinion, but one that grows some of the most amazing fleece around. I had dyed these locks with coreopsis way back when. Really, when, two or three years ago? So, that’s what I had. I used a superwash merino sockyarn as the core. This was a very easy yarn to spin. Not a very easy yarn for my wheel to take up. 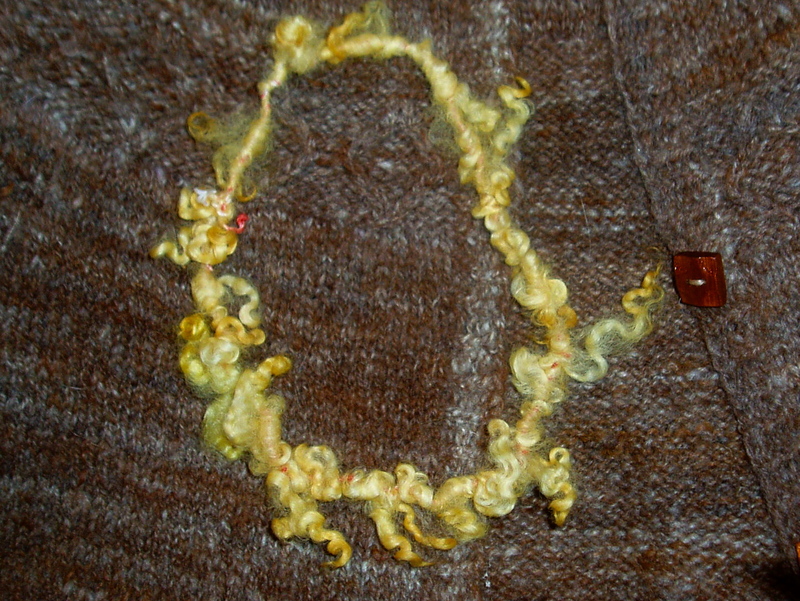 The locks got caught on the spring clip that the yarn threads through on its way to the bobbin. Made me CRAAAAZY. But, not much harm done to my psyche. That handful of locks was just enough to cover the few feet of unwindable core. Ta da. This won’t be a big favorite in my studio, until I add to my collection of, ahem, 1 spinning wheel. I get it! I get it! I didn’t understand before, but now, I DO! Corespinning is a way to really show off a most excellent pile of gawjus fiber. Spin a killer beauty of a batt, and not one single fiber will be hidden as the “center” of the yarn. It’s ALL on the outside. That said…the batt really should be a killer beauty. 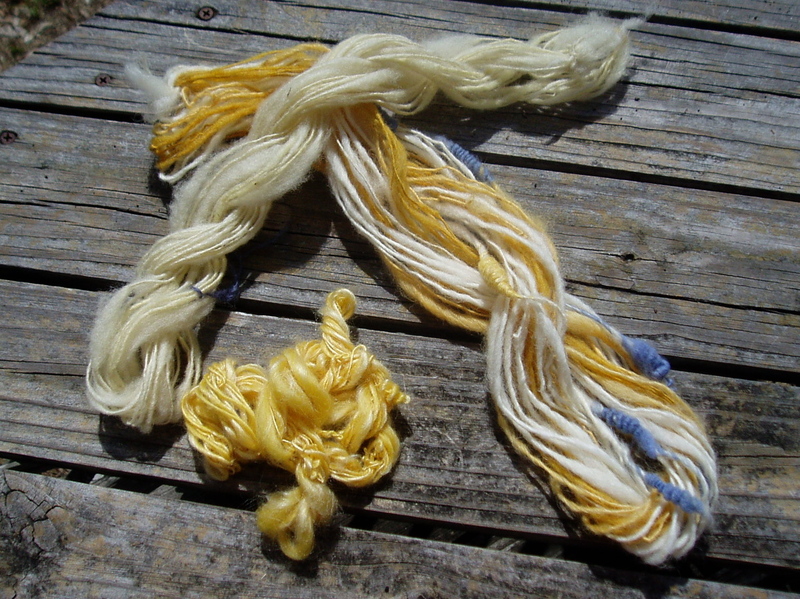 My fiber was killer beautiful…Gulf Coast Native dyed with coreopsis, with marigold, with indigo, and with some purple acid dye, rabbit, and mohair too. But…I sorta overcarded this pile of beautiful stuff…and turned it into mud. Boo on me. Still…I’m delighted to have spun a successful, soft, balanced 22 yards of corespun naturally dyed (for the most part) fiber. I used superwash merino for the core. Blecch, that stuff is so bizarre. But, it makes a fabulous core! Alrighty, then. Time to move along to the next technique in jacey boggs’ lovely book, spin art. TDF Day #3 – Tornado! Jacey Boggs says that the Tornado is a fiddly spin. And she speaks the truth. It’s a slow going yarn to make, uses a ton of material, and in the end? It’s pretty darn cool! 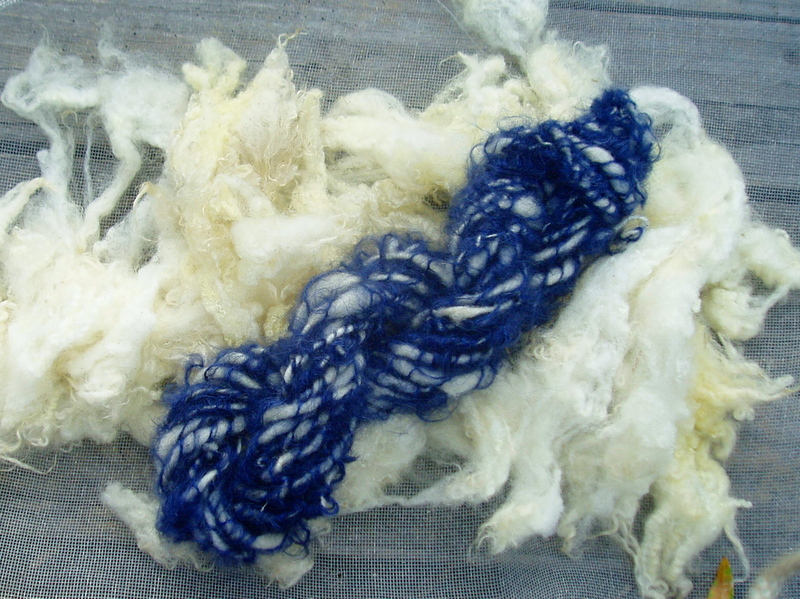 For my first attempt, I used blue Corriedale roving, unearthed from a bag of acid dyed fiber that I prepped about 30 years ago. No, no joke! Ha! 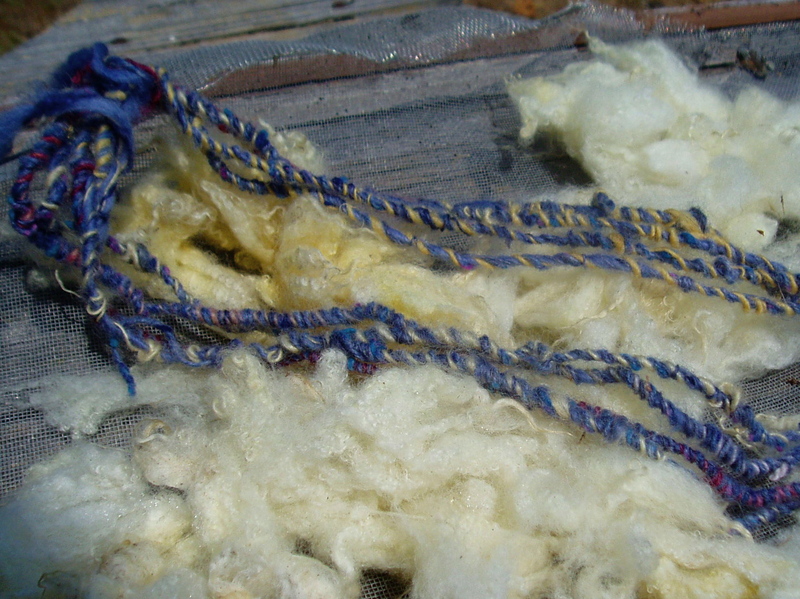 For the triple singles wrap, I used a spindlespun indigo dyed Gulf Coast, a 2nd Gulf Coast yarn spun from space dyed roving, and a rough lumpy bumpy tweed singles. 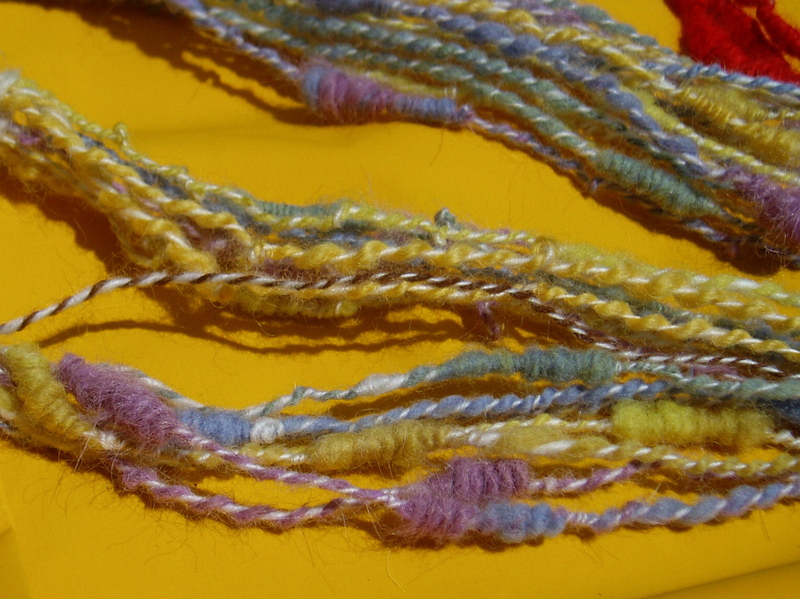 The yarn is pretty cool looking, but handling 3 singles, “shuffling” them onto the core, well…that wasn’t working out. I was autowrapping them, more or less. And really wanted to try to get that random loopiness. So, Tornado Number 2 was born. For this yarn, I used a naked Corrie roving as the core, and 2 of the 3 singles wraps I used for the first yarn. I replaced the rough tweed singles with a rayon ribbon yarn. And this time, I shuffled. It was like fingerpainting wearing rubber gloves. At first. But, there came a point…and the switch flipped, and ka-boom…I was building a tornado!!! 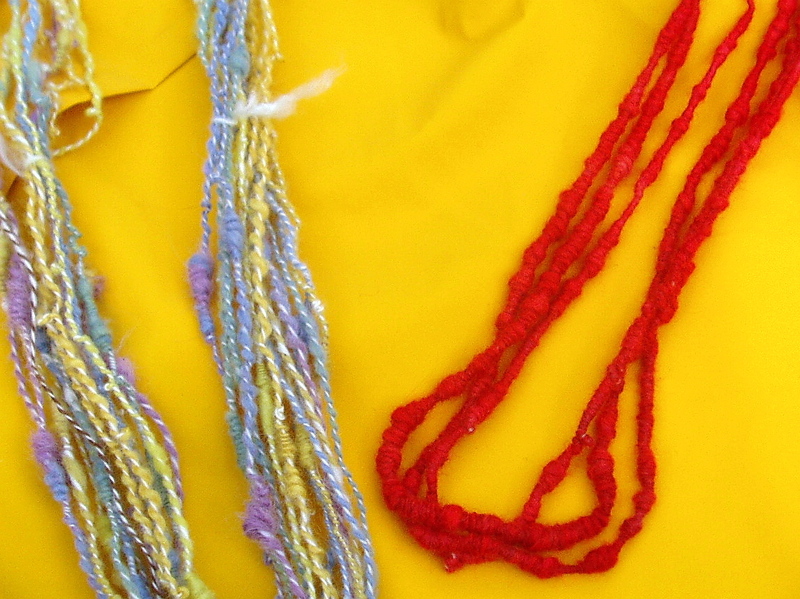 These little skeins are simply experiments. To be really proficient, all I would have to do is sit and spin – for a good stretch of time. What I am doing, though, is finding out. I’m spinning long enough to Find Out if these yarns are yarns in which to invest myself. And what I’m finding out is that, yes, I do believe there is a future for textured yarns in my studio. Look at this little skein. 14 yards of Autowrap. I’m pretty happy with the results, even though I need a lot of practice to make the autowrap I see in my mind’s eye. This yarn is a little trickier to spin than the Racing Stripe. I spin on a Fricke, which has a Delta orifice. Part of the charm of this yarn is the true abandon with which it’s spun. With a Delta orifice, or in fact, with any “outie,” the spinning is done in a more careful manner, using a finger to control that which is just left to let fly on other wheels.